Social media provides information at your fingertips. Long are the days when we waited to watch the local news on television or even read it in the local paper. Now when breaking news happens, we turn to social media for the most up to date information by the minute. 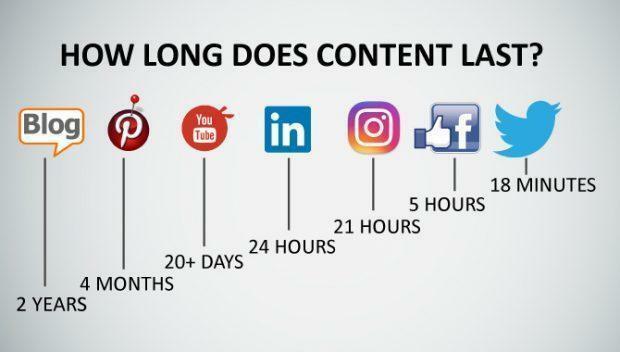 But how long does your content last? How long is it relevant? 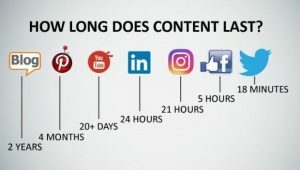 An IT company, Mamsys, came up with the lifespan of social media. It goes to show how much things have changed in the past two years. 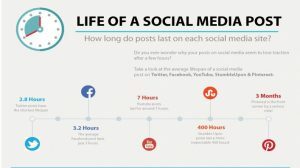 Here’s an article from Business 2 Community in 2015 on their estimates of the lifespan on social media. How do you keep it fresh? The most common tip to keeping posts relevant is including images. Another is trending topics or evergreen stories. How often have you seen an article cycle through a newsfeed for weeks or even appear again months later? You can always re-post or refresh the content. You can also try posting it on a different platform than what you used before.